The Wisconsin FFA Foundation celebrated the achievements of the 2017-18 campaign and its 35-year history at the 89th Wisconsin FFA Convention in Madison last month. 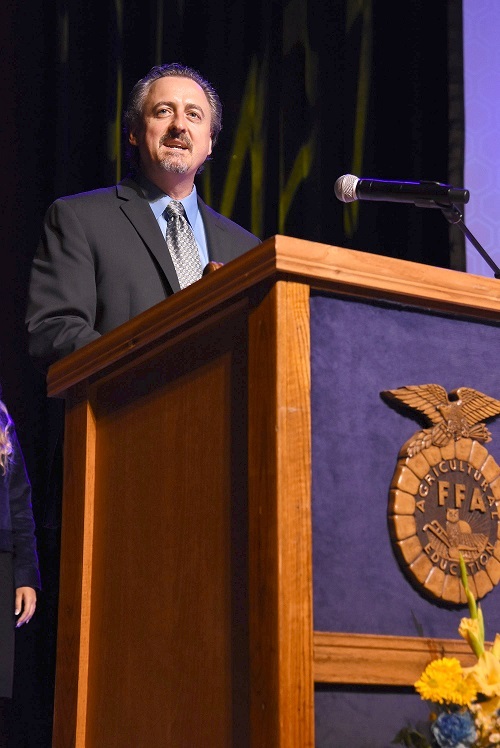 On Tuesday evening, Foundation Board Past President Jon Anderson announced that $503,548 was donated by hundreds of individual, industry and FFA-related donors since June 2017. These funds continue to support many programs, awards, agricultural education partnerships and other needs for members, teachers and FFA Alumni around the state. To read the full press release, visit this link. 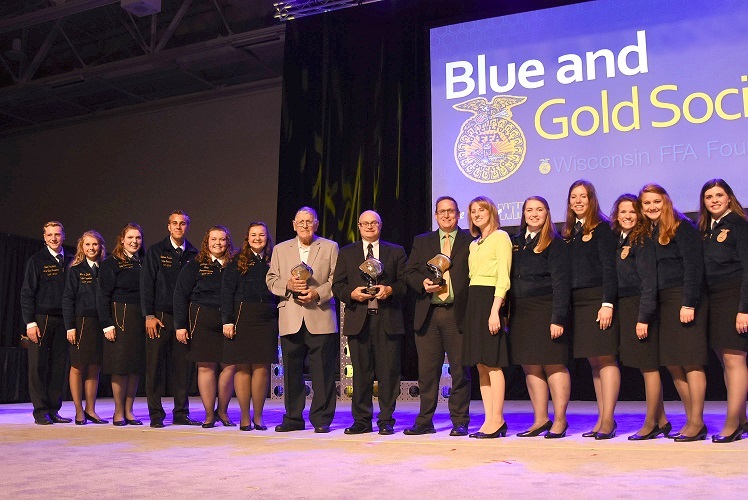 Two new members were inducted into the Foundation’s Blue and Gold Society at the 89th Wisconsin FFA Convention in June. 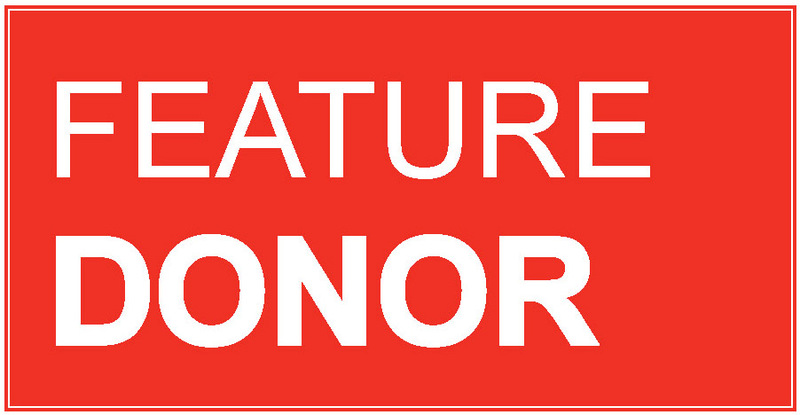 This is a prestigious group of donors who have pledged $15,000 to the Foundation over a three-year period. The Blue and Gold Society was formed in 2001 and with these inductees, numbers 33 in membership. James T. Grasee and Mary Handrich-Grasee are from Denmark, where Mary is the agricultural education instructor/FFA advisor and James, a financial advisor. William and Nancy (Carroll) Maurina and Family were also inducted into the Blue and Gold Society this year. William was the Barron FFA advisor and ag teacher for many years, and joined by his wife, Nancy, for much of his career before she passed in 2015. Also honored was the Family of Gordon J. Iverson, DVM “Doc”, which has been a Blue and Gold Society member for the past three years. They have continued to show commitment to Doc’s legacy through regular contributions to the Gordon J. Iverson Endowment. 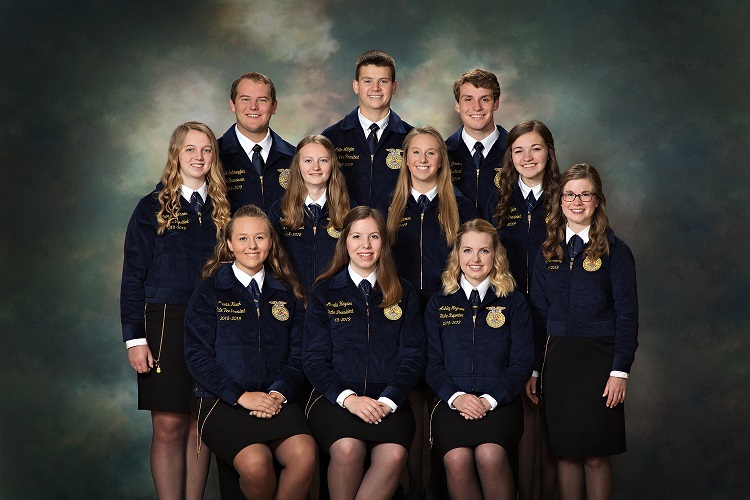 The Wisconsin FFA Foundation said good bye to three board members and welcome three new directors at its June board meeting, held at the 89th Wisconsin FFA Convention. Retiring board members were Travis Holt (Citizens State Bank of Loyal), Janice Schyvinck (Equity Cooperative Livestock Sales Association) and Scott Vosters (Bank of New Glarus). Holt served as the Foundation president from 2015-16. Three new members were welcomed to fill those seats: Joe Keller, of Keller Farms in Prairie du Sac; Jessie Kreke, senior marketing manager for Culver Franchising System, LLC (Culver's); and Jesse Singerhouse, manager of Administrative and Member Services at Dunn Energy Cooperative in Menomonie. Pictured above, the 2018-19 Wisconsin FFA Foundation Board of Directors includes: (front row l-r) Director Tom Bressner, Wisconsin Agri-Business Association; Director Jessie Kreke, Culver Franchising System, LLC; Vice President Danielle Waterworth, CNH Industrial Capital; Director Amber Vickers Keller, Town Bank; and President Ginger James, AgroChem. (Second row l-r) Director Jesse Singerhouse, Dunn Energy Cooperative; Director Jason Kollwelter, We Energies; Past President Jon Anderson, Grade A Strategic Brand and Marketing Solutions; Director Janet Schneider, Stewart-Peterson, Inc.; Secretary Robin Connelly, Organic Valley/CROPP Cooperative; and Nicole Nelson, Wisconsin Association of Agricultural Educators representative. (Third row l-r) Director Joe Keller, Keller Farms; Director Chris Schneider, Investors Community Bank; Treasurer Kathleen Murphy, TASC; Director Luke Wiedenfeld, Lake Mills High School; Director Nicole Wagner, Wisconsin Corn Promotion Board and Wisconsin Corn Growers Association; and Cheryl Steinbach, Wisconsin FFA Alumni representative. Not pictured: Jeff Hicken, State FFA Advisor; Cheryl Zimmerman, Wisconsin FFA Center Executive Director and Amelia Hayden, State FFA President. As the 89th Wisconsin FFA Convention wrapped up last month, another year of hard work, accomplishments, and learning concluded for our Wisconsin FFA members. During convention, the Foundation celebrated its 35-year anniversary and we were proud to announce another successful campaign year of over $500,000 raised to support our members pursuing their passions and future careers in agriculture. Thank you for your part in that achievement! Another big announcement came with Wisconsin FFA membership – now totaling 21,173. This increase to a 39-year high underscores the need to grow our support of individual member and chapter needs. I am excited to work with our new State FFA Officer Team in the coming year to serve our membership and promote our mission to all Wisconsinites. Again, I say thank you for your continued support of our goals – your gifts of time, talent, and treasure have made the difference and demonstrate that agricultural education is a worthy investment. Please enjoy the updates in this Corduroy Connection and have a safe, productive, and enjoyable summer! The 2018-19 State FFA Officer Team includes: (first row l-r) Section 1 State Vice President Alexis Kwak from Prairie Farm FFA; State FFA President Amelia Hayden from the Big Foot FFA; State FFA Reporter Ashley Hagenow from the Rio FFA; and State FFA Secretary Paige Nelson from the Ellsworth FFA. (Second row l-r) Section 4 State Vice President Amber Patterson from the River Ridge FFA; Section 9 State Vice President Sarah Calaway from the Denmark FFA; State FFA Parliamentarian Emily Kruse from the Elkhorn FFA; and Section 7 State FFA Vice President Jillian Tyler from the Granton FFA. (Third row l-r) State FFA Treasurer Mitchell Schroepfer from the Antigo FFA; Section 3 State Vice President Collin Weltzien from the Arcadia FFA; and State FFA Sentinel Gaelan Combs from the Verona FFA. Follow along with the 2018-19 State Officer Team on their travel blog, which can be found at this link. They will travel all around the state in the coming year, visiting local chapters, hosting leadership conferences and spreading the mnessage of agricultural education. Congratulations! Founded in 1925 by brothers, Bill and Otto Brakebush, Brakebush Brothers, Inc. originated with the purchase of a single Chevy truck financed with a loan provided by the local central Wisconsin farmers. The Brakebush brothers then bought eggs from these local farmers and distributed them to the greater Wisconsin and Chicago areas. From these humble beginnings, today’s Brakebush has arisen. Over the years the company’s products have changed from the egg to the chicken, but the company still remains family owned and operated. State-of-the-art cooking operations in Westfield, WI; Wells, MN and the newly acquired facility in Mocksville, NC as well as a portioning facility in Irving, TX allow Brakebush to offer a wide variety of further processed and ready-to-cook chicken products ranging from tenderloins, wings, popcorn chicken, and breaded or grilled fillets to innovative products such as Sriracha Chicken Bites™, Tater Chip Strips™ and Thigh BoneZ™. With the help of a dedicated, experienced workforce that now numbers over 2,000, Brakebush has kept the same ideals that the founders started - providing the highest quality products to meet the needs of restaurant operators, schools, healthcare facilities, convenience stores and everyone who wants to serve their customers great tasting chicken. “Brakebush and the FFA originated within a few years of each other. 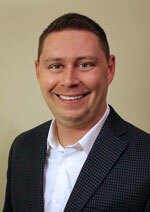 We share many of the same core ethics and values; accepting challenging work, developing leaders and being a positive influence in our communities” said Rusty Schieber, Brakebush Vice President of Operations Support and former Montello FFA member. “I am very proud of the histories of both of our organizations and look forward to continuing our support of the Wisconsin FFA”.